The two gites are located at the edge of a friendly pretty little village with 2 restaurants/cafes, bakery, tabac, pharmacy, post office and small supermarket all within 3-5 minutes walk. We offer comfortable cottages which are bright and airy, freshly decorated with high ceilings and exposed beams and are attached to owners house. Outside we have a large front garden with parking for 4 cars. Very large enclosed rear garden with fruit trees, boules court, Table Tennis and a superb new 12 meter x 6 meter swimming pool fully fenced off for security making it ideal for children. The cottages are identical and are located central to all local attractions, La Rochelle with it's towers and beautiful waterfront restaurants, the beautiful island of Ile de Ré, which is well worth visiting, The Venise Vert and it's beautiful canals, Mervent Forest for a lovely days picnic and of course the superb blue flag beaches of Aguillion and La Tranch only 20 minutes away. This is a wonderful place to relax and let the children really enjoy themselves. 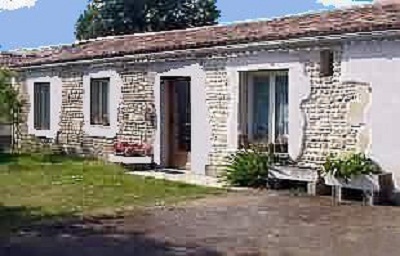 Each gite is identical and is converted from an ancient barn to a good standard. With it's original roof trusses, beams and tiled floors throughout it gives you the comfort and peacefulness that ensures a good holiday. 1st bedroom has double bed, wardrobe, bedside table, chest drawers, large window to garden. 2nd bedroom has single bed and bunk beds, wardrobe, bedside table, chest drawers, large window to garden. Bathrooms:Shower room with toilet, wash basin, and shower, window to garden. Kitchen:Kitchen/Diner has base and wall units, work top, sink, fridge, full size cooker, microwave, coffee machine, kettle. Dining Table and 6 chairs. French doors lead to patio and garden. Utility Room:Separate shared laundry room with washing machine and iron etc. Living Rooms:Lounge with high ceilings and exposed beams is bright and airy includes, 3 seater settee, 2 armchairs, coffee table, sideboard, Freeview TV, DVD player, Video player, Hi Fi unit, CD's, radio. Also an internet socket is provided in each gite for internet/broadband/WIFI services. All the rooms are bright, freshly decorated and have large windows and views to the front or back gardens. A cot is also available free on request. Linen can be supplied for a small charge, this includes fitted sheets, duvet covers, pillow cases, towels, tea towels and bathroom pedestal mats. Other:French doors take you to your own small private patio with a full size barbeque, table and 6 chairs with parasol, 2 loungers and access to the very large garden with superb swimming pool. The large front garden is grassed with flower beds and trees and parking for 4 cars. The rear garden is very large, grassed with many fruit trees (apple, pear, apricot, plum), it is an ideal area for playing badminton, football etc, running around to let of steam or perhaps simply relaxing under a tree and reading a book in the shade. There is a 12 meter x 6 meter swimming pool for guests use, this is fenced off for security. We also have an 8 meter boules court..... And a Table Tennis table. The garden is really lovely and totally child friendly as it is completely enclosed and safe. Prices are shown per gite per week in UK pounds and include electricity, water, and 1 bottle of gas per week (which is usually more than enough). Security deposit of £150 per gite is payable, this is fully refundable if no damage to the property and left in a clean and tidy condition. Guests arrival time after 4pm and must please leave by 11am. Towels and linen are not provided unless asked for at a small extra cost. Beach towels are not provided at all. The property is thoroughly cleaned and ready for when you arrive. Booking deposit required to secure the booking will be 25% of the rental. Throughly relaxing. Wonderful for the children. The garden and pool has made this holiday. Very comfortable Gite. had a lovely time. Thanks. Thanks Karen and Peter. Had a lovely time. Kids really enjoyed the garden. We are in the South West Vendée in the beautiful National Park 'Marais Potevin' which is an area rich in history and culture where we have a mini-climate similar to the South of France. Our gites are located in the village of Champagné Les Marais, this is a typically rural french village which provides a fine selection of facilities for locals and visitors. Less than 1 minute (50 metres)from the gites is the very friendly boulangerie (bakers) for your French breakfast croissants, baguettes, mouthwatering fruit flans and cakes of all descriptions (an absolute must for those with a sweet tooth). Opposite the boulangerie is a large pharmacy which has a full stock of all medication. Around the town square there are also two cafe / restaurants for a relaxing drink or a lunchtime / evening meal. The nearest town is Lucon, located 9km away, this has many shops, a cathedral, beautiful 9 acre garden, and a great selection of cafes and restaurants. La Rochelle is a must to visit, it has 19km beaches, a historic old port, lots of restaurants and cafes along the waterfront where you can sit and watch the world go by, ancient arcade shops, Europe's largest Aquarium, and a Marina. Venise Vert with its beautifully interlocking green canals. Mervent Forest a paradise for walkers and cyclists. Ile de Ré is very exclusive,with long stretches of sand dunes and restaurants. Beaches at La Tranche, La Faute, Auiguillon, La Sable. Futuroscope. Puy de Fou, step back in time with its medieval village. The Blue Flag soft sandy beaches of the South West Vendée are magnificent. Both unspoilt and uncrowded they stretch for miles and miles in one of the sunniest parts of France. The beaches are gently sloping and clean. The sea is very calm and superb for children. Also as there are so many miles of beaches they do not get packed even at the height of the season. Starting from the town of Auiguillon in the south of the Vendée( 20 minutes from us ) you can follow the bay through to La Faute sur mer and then onto La Tranche sur mer, all within 45 minutes gentle driving from our cottages. Always in the lea of the Ile de Ré, the beaches are gently sloping and the waves are small making them ideal for families with young children. but there is a charge for this and it is only open July - August. La Tranche is a beautiful safe beach and in the town is an exhibition park / garden. The market is also well worth a visit. 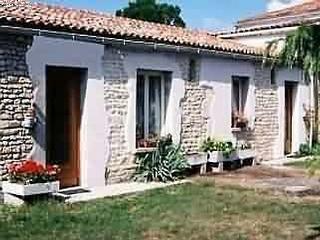 La Sable d'Orlonne is about 22 miles up the coast and also has a beautiful beach but popular. It can get very, very, crowded. Go to the shops in the old part of town or see some of the lovely churches. All the nearby beaches and directions are detailed in our Gite information booklet. Nearest airport is La Rochelle which is 35 minutes away, Nantes is 1 hour away.